You don’t necessarily have to take our word for it, but Awooga’s new album ‘Conduit’ is one of the best albums of 2018 so far. In alt-metal terms it’s got everything: huge riffs, the kind of space-filling sound that’s rarely been heard outside of A Perfect Circle’s ‘Mer De Noms’ and the Smashing Pumpkins‘ ‘Siamese Dream’ and a sense of atmosphere to back up the heaviness. The album’s trippiest offering ‘Blue Rose’ now has a new music video, which you can stream in full below. We’ve always aimed to bring an eclectic coverage of music at Real Gone. We’ve always insisted on mixing genres and covering bigger bands we love alongside some really underground DIY releases. Since the site launched in November 2009, there’s been a lot of music to get excited about, but the first quarter of 2018 could be one of the most enjoyable yet. 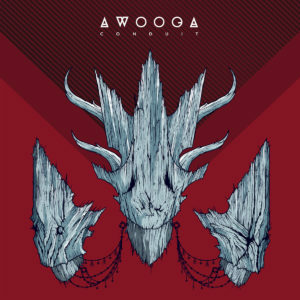 Creating a hybrid metal-based sound of doom, grunge, sludge and progressive metal, Awooga floored at least half of the competition with their debut EP ‘Alpha’. Taking cues from Deftones, Tool and Amplifier, the band created a sound that went far beyond being just a composite of its influences; a brilliant technical ability and a melodic vocal often contrasting the heaviness made it very compelling listening. Approximately eighteen months on, the Sheffield-based riff-meisters have created something rather special in their first full length album. ‘Conduit’ takes everything that was great about the EP and refines it and improves upon it, but without any temptation to make it more commercial. The production is amazing; the songs – if indeed they are songs as opposed to a collection of amazing riffs with a vocal weaving in and out – each showcase a band who’ve really taken their time in making sure everything is almost perfect. And it shows: there’s barely a note out of place , and with the album clocking in at an old fashioned forty minute running time, there’s been no temptation to waste a second of it.